insight – in(wards) sight to nature (my own). Insight – a ‘gift’ (deeper understanding, liberation, etc), insight – it, whatever it is, is within grasp (ironic within means inside ). Self – love. Now love is not singularly definable from a being perspective. What I mean is that when we are being..whatever it is in the moment, love comes in many colours. 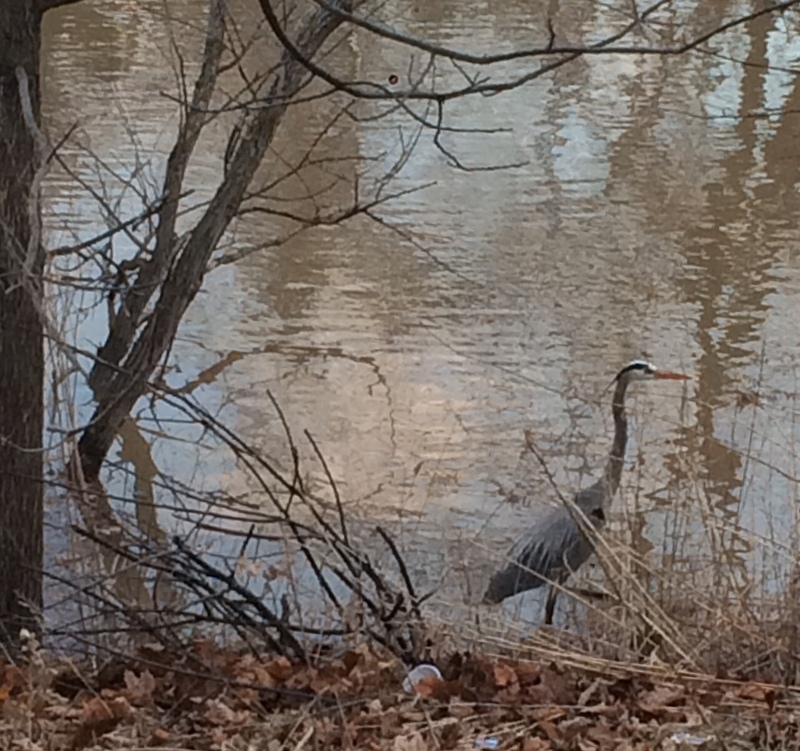 Today’s was Great Blue Heron. Self – determination. Self – reliance. These are attributes of self – love which I will elaborate on momentarily. The other interesting fact garnered from a book entitled Animal Speak by Ted Andrews, is that the long, slender legs of the Blue Heron imply that you don’t need massive pillars to be stable. In addition, these long legs allow it to wade into deeper waters (explore a deeper connection to multiple elements of Mother Earth) and with it’s ability to fly, indulge in heavenly wisdom. Love is the word du jour. Everyday. It’s like that line in the Lord’s Prayer – “Give us this day our sufficient bread”(this is taken from a book entitled The Source of Miracles by Kathleen McGowan). And every day I receive some ‘sufficient bread’ in the form of a challenge, event, trigger, blessing, gift… I think you get the idea, that allows me to learn self-love. Self-determination and self-reliance are nature’s reminder to me or guidance in how to handle some current events based on my blessing of witnessing this majestic bird up close. Except before I can progress and evolve, I’ve actually had to reconstitute what those two terms mean. And I realize that this new understanding is not set in stone. Summarizing the change in understanding – I used to have a very narrow definition and a righteousness / perfectionist / elitist association with them. Rather disempowering. I used to want to be self-determined and self-reliant which in themselves are not bad but the fashion in which I thought ‘achieving’ them was incomplete. Under the umbrella of self-determination and self-reliance is the process of coping. Coping with, handling, mediating whatever wave I’m riding. If it’s not a particularly pleasant wave, such as anger, frustration or confusion, my default was always to shut down, lash out, engage in escapism behaviours, run (literally and metaphorically). Could be a combination of these three or just one of them singularly. As I child, I hid in my room, if crying was involved, it was suppressed and or hidden. Present day ramification of this – Who would want someone who cries to deal with stuff, get’s angry, runs away? Extrapolating this into a full blown neurosis – I’m not good enough, nor wanted. Now I’m exagerrating a bit but this was some of the old way of being that’s had to change for my overall health. Self-determination has the elements of being responsible and accountable for myself (includes thoughts, actions, emotions, consequences) and is a dance. Meaning, I seek insight within to choose the best option, not necessarily the most positive, in the best interests of myself and if there are others involved, taking that into consideration. I submit my will (egotistical nature) to that of Divine Will, in essence, self – determination has an element of surrender and letting go to actually know. Self – reliance. I am solely responsible for how I process my emotions and thoughts. I have to be able to offer myself some level of support, nurturing, respect and so forth to ensure that my nimble, long legs support myself. It doesn’t imply that I can’t rely or seek others for assistance, which used to be my only option because I hated asking for help for fear of being judged (vulnerable, incompetent, rejected,etc). Self – reliance has also taught me levels of compassion, connection and more due to the fact that I recognize that many of us are always dealing with something and if I can offer some one a kind word, help, whatever…it goes a long way. We are in this together. This is just a snapshot and not a go-to method used every time. I will recap and elaborate all in one shot though. One of my comping methods for any emotion is shutting down, then frantically try to run away. Can’t, couldn’t or wasn’t able to cope with the energy of internal stuff (emotional, mental) and there would be a build up inside. Things that triggered, are always the same in one way or another; work, people, current circumstance (all generically speaking because the specifics of the context change with time). The emotion, again, didn’t matter either (anger, frustration, fear, trying to figure stuff out) with the end result always shutting down. Question – Is it my choice to hold on to this feeling? Next Question – If so, what purpose / lesson does it serve? Is the meaning deeper or just a reminder to to let go and choose a better attitude? Answer to Next Question – I literally ask myself internally, what is the purpose, is there a lesson, etc and please show me in a form I recognize or understand. If I’m not ready for the answer, I am ok with that, I will wait patiently. So I sit with the emotion, observe it, not fix it. I try to just listen and be. Way easier said then done. If it passes great, if it passes and comes back repetitively than I realize there is a deeper lesson. Bottom line, is I always have a choice. This entry was posted on Thursday, April 16th, 2015 at 3:35 pm and is filed under Uncategorized. Tagged: angels, awakening, Divine will, God, how to cope, how to deal with anger, how to let go, how to love yourself, markings of the soul, meditation, merlin x, nature, poetry, spirituality, trust, unconditional love, vulnerability. You can feed this entry. You can leave a response, or trackback from your own site.